The pink amethyst gemstone needs a shape that beautifully compliments its natural beauty. 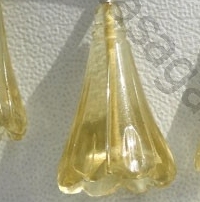 If you are looking for such a shape then take a look at our tulip flower bead shape. The pink amethyst tulip flower beads brilliantly enhance beauty of this powerful healing stone. You can easily use it in jewelry like necklace, rings, earrings etc to get the maximum benefit of pink amethyst’s powers. The unique tulip flower shape has not only won the hearts gem lovers but also the ones who have little love for gemstones. This tulip shape reminds you of many colors of tulips and that’s why Ratna Sagar Jewels has used colored gemstones like crystal gemstone, pink amethyst, lemon quartz and fluorite gemstone beads. 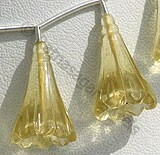 All our gemstones are AAA quality certified and non-treated. 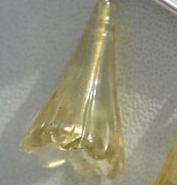 They possess unique property of clearness with vitreous luster. You can also buy customized pink amethyst flower shaped beads at a wholesale price. Check online collection of Ratna Sagar Jewels and buy the tulip flower gemstone beads and bring love and happiness in life. 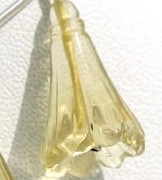 Lemon Quartz Natural Gemstone is varied minerals on earth, possess property of transparent eye clean with vitreous luster and are available in green-gold color with artistic cut, lomg flower Shape.